An Edmonton man was killed in a hit-and-run collision in Grande Prairie Monday night. 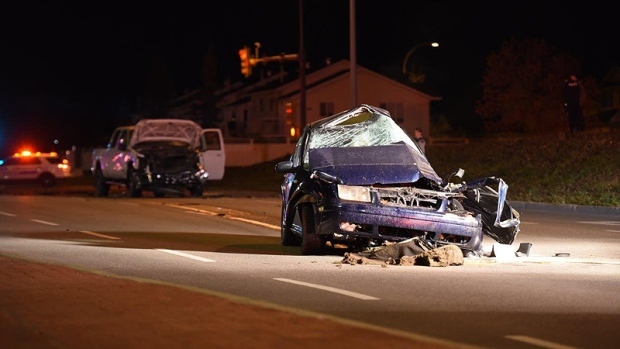 RCMP responded to a two-vehicle collision between a Ford F350 and a Volkswagen at the intersection of 100 Street and 68 Avenue at approximately 10:18 p.m. The driver of the Volkswagen, a 26-year-old man from Edmonton, succumbed to his injuries in hospital, RCMP said. The driver of the Ford F350—a white man wearing black clothes, and with a possibly injured arm—fled the area on foot. The pickup truck was reported stolen in Grande Prairie on October 15. Before the crash, police saw the man driving erratically on 116 Street. They attempted to pull him over, but he failed to stop. Anyone with information about this fatal crash is asked to call Grande Prairie RCMP or Crime Stoppers.